It was Spa Day for Seven! How Did Burt's Bees Stand Up Against Seven and THE Fur? Let's face it. I have a 92 pound dog with more fur than most people would ever want to experience. A Rough Coat Collie is the epitome of fur and lots of it! Between shedding, bathing and grooming, I live with fur. 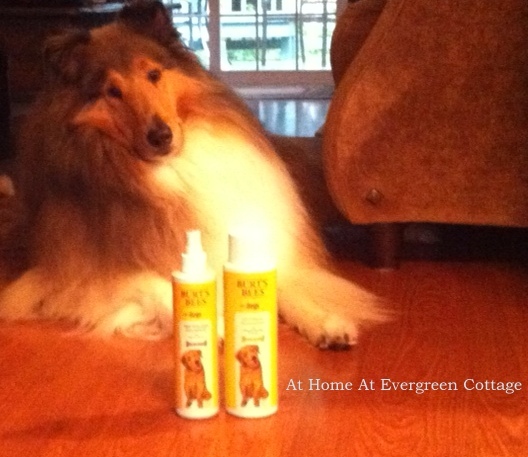 So, when I saw Burt's Bees for Dogs Oatmeal Shampoo, I thought I would give it a run for its money. 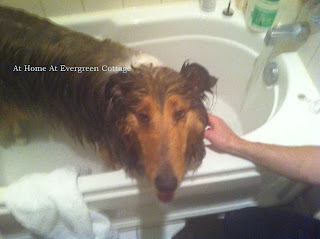 Thankfully, Seven is a house dog and doesn't need to be bathed often. Couch potato dogs just don't get as stinky and dirty as outside dogs. There is no rolling in the grass, mud or other things that will go unmentioned here. He is brushed daily, and several times a day at that and spot cleaned if necessary. The thing you notice sometimes with a dog like Seven is that he gets dry skin. Really dry skin needs special attention. That special attention is usually a bath and a good shampoo that gets to the skin and soothes the skin. Burt's Bees you had your work cut out for you between the crazy amount of fur to get through and the dry skin! 1. The fragrance was nice and not over powering. 2. Despite having a dog with so much fur, it was easy to get the product to lather and then to rinse. Rinsing Seven usually takes much longer and requires more water. It was much quicker with Burt's Bees. 3. Seven's fur is so beautifully soft. His coat feels like silk after this latest bath. 4. The dry skin issue is completely cleared up. Seven's skin looks nice and clean. 5. There was no residue left in the tub after Seven was out making it a much quicker and easier clean up. Seven Bathed and Completely Dry with His New Fav Shampoo! As you can see by the photo above, Seven's fur has completely dried and has expanded to its full and natural volume. In the picture is the shampoo that we used (on the right). On the left is a different shampoo to use if you don't want to bath the whole dog. We haven't tried it yet, but I am sure that we will. When we do, I will let you know how it goes. 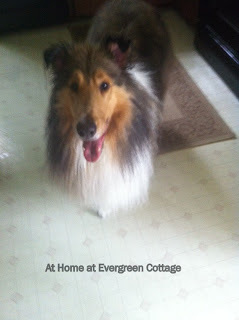 For the regular Burt's Bees Oatmeal Shampoo for Dogs, I am giving it a At Home at Evergreen Cottage Stamp of Approval! NOTE: I was neither paid or approached to do this product review.